Re-enforces leadership qualities and decisiveness – GemPowerment. Reveal your light. 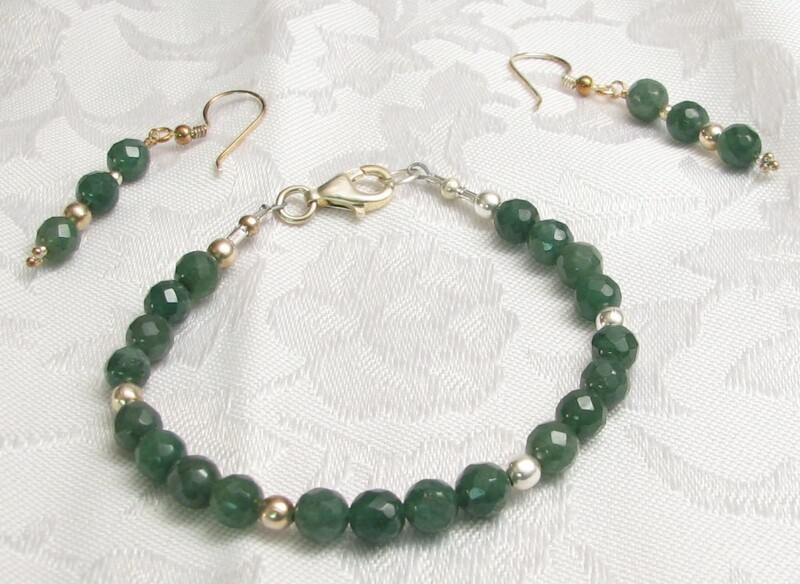 Dark Green Aventurine is stone prosperity; not only of money, but of health as well. Green aventurine absorbs electromagnetic pollution (very good taped to your cell phone), balances male/female energy, promotes compassion & empathy, and stabilizes one’s state of mind.This stone re-enforces leadership qualities and decisiveness. This stone is also excellent for protection of the heart chakra, guarding against “psychic vampires” who feed on heart energy. Green aventurine is good for the thymus, connective tissue, and skin, and is an all-around healer for the heart, lungs, and adrenal glands. It vibrates to the number 3. The bracelet are in sections of four stones separated by the sterling silver beads. The vibration of the four is about stability, consistency, and discipline, to organize things into right manifestation. This piece is good for those who would like more of these qualities in order to be able to create the desired outcome, especially around career or health goals.